When I went to Dubai, I had a chance to visit the capital city of United Arab Emirates which is the Abu Dhabi. From Dubai, it is just 1.5 to 2 hours travel. I came to this city with my college friend through the bus we took from Al Ghubaiba Bus Terminal. We used NOL card in our travel but before that, we made sure that it has at least 100 AED to cover our return travel. At the start of the trip, I fell asleep immediately but it didn’t last long because I suddenly woke-up due to the loud voice I heard coming from the driver. After that I was not able to sleep anymore until we reached Abu Dhabi. We arrived at Al Wahda bus terminal in Abu Dhabi, where there is a nearby mall with the same name – Al Wahda mall. At the mall we had our lunch first before we started our tour. It’s a hot sunny Saturday that day, I myself does not really want to walk outside because in just a matter of few minutes, my whole body will be soak in sweat, which is an uncomfortable feeling while traveling around. We decided to visit first the famous mosque not only in UAE but even in the world, it is non other than Sheikh Zayed Grand Mosque. We took cab from Al Wahda mall to the grand mosque. Seeing the mosque from afar is already amazing, being there is another thing. We arrived at the mosque and my first impression is, it is like an all white mosque. And the design of the mosque is magnificent. I saw a lot of mosque from other countries but for me, this one is like a palace mosque, not only because of its size but the impression struck on me when I saw on it are purity and tranquility. 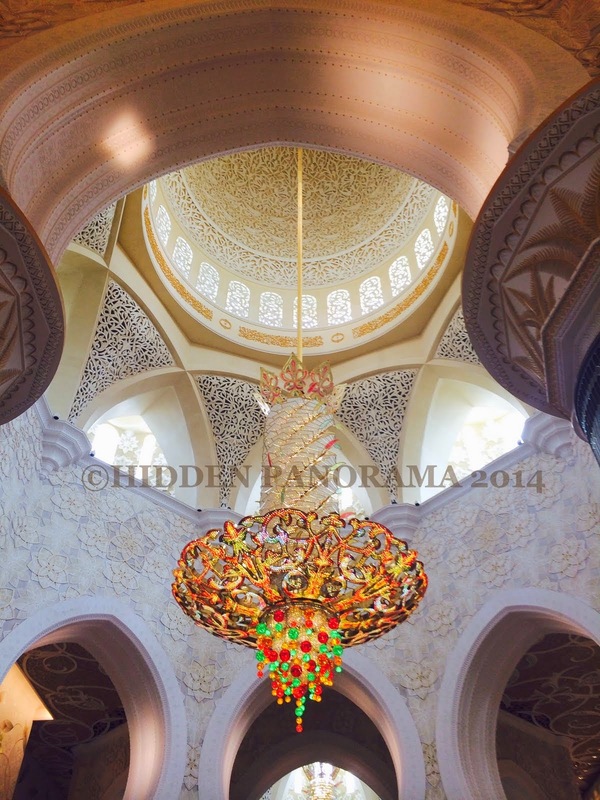 I learned that the mosque is the largest mosque in UAE and the eight largest mosque in the world. I am aware that before we were able to get inside the mosque, we need to change our clothes to Abhayas, we lent it (required with ID) from the visitor center located at the lower ground of the mosque (tourist will be informed by the security guards of its location). After changing to appropriate attire, we started our mini tour inside the mosque. At the front, left and right side of the mosque, you can find a pool which refreshing from the eye because of the ocean like color of the pool. While walking along the hallway, I admire the details of the design and to think its a hallway and not the main hall yet. When we came at the mosque, we are not allowed to walk just anywhere in the Courtyard (it is the huge open space at the front of the main prayer hall), we walked in the middle of the courtyard when we are on our way to the main hall of the mosque. Before we enter in the main prayer hall, we removed our shoes and put it in the cabinet allocated just outside the main hall. The cold breeze we felt at the entrance of the main hall was refreshing maybe because of the hot temperature outside the mosque. At the entrance, we saw a magnificent chandelier and the ceiling design that it has. I was really amazed how grandeur it is. At that moment, I can really say it deserve to be called grand mosque. And the glass door has great designs embedded with bright colors that for me, it’s like a magic door that if you open, there are great things to see. My expectations became higher and higher which I was not disappointed because at the time that I entered the main prayer hall the majestic hall design are far greater from the entrance, details to its architecture and interior design are noticeable that what you can say is it’s amazing. Looking at the interior design, you can tell that the time it was being build, it was thought carefully and the outcome is magnificent. We walked silently as to show respect to the mosque but my eyes keep on looking around the hall and I took pictures as much as I can to remember all the things that I saw inside the main prayer hall. I respected the people who put an effort to build the mosque because they show how high they regard their belief through the building of the said mosque. After spending sometime inside the mosque, we decided to go to Marina Island. We went straight to Marina Mall and had our snacks at Marina Tower. Marina Tower is a good place to see most of the Abu Dhabi in a relaxing way where you will not suffer from hot sunny day. There are restaurants where you can have a great view from the top of Emirates Palace, Presidential Palace, the business district of the city and beaches along the coast line. Like Dubai, there are on going constructions in different parts of Abu Dhabi, not looking far away, the corner of the Marina Island, development still in progress. In such as desert place, I am still surprised how people able to live in a place where there is no natural resources such as food and other immediate needs of people. I heard from my friend that UAE are all importing most of the goods they need like food such as rice and vegetables, because there is no place in this country that will allow them for farming. By knowing that, I understand that this country has rich and great economy because they are able to surpass the challenges of the desert that they are living in. I know there are still other places to see in Abu Dhabi, but unfortunately our day was over and we cannot stay longer in the city as we need to go back to Dubai. I enjoyed my day in the city and wished that someday I can still go back and see the other places that I missed to see. Until then.